The Fifth Karmapa, Deshin Shekpa, spoke of the future Karmapa. Some of the details of the Seventeenth Karmapa’s life were foretold in the prophecy of the Fifth Karmapa. Some prophecies regarding the life of His Holiness predicted difficulties during the transition from the 16th to the 17th Karmapa. In particular, the vision of Chogyur Dechen Lingpa indicates that there would be a disagreement over the Karmapa that would be resolved by focusing on the inseparability of the mind of the Karmapa and Tai Situ Rinpoche. 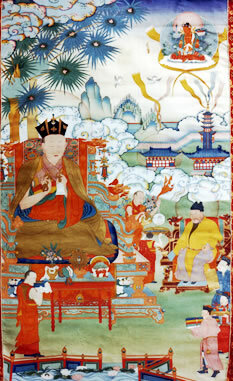 The prophecy of the 5th Karmapa, Deshin Shekpa (1384 – 1415), provided an even more detailed vision of the time of transition. Having dark maroon colour and eyes protruding. In Tibet this will occur, I think. Will disturb the center and destroy the center’s domain. [Not knowing] what has arisen, will conceal. It is not that they don’t have compassion. 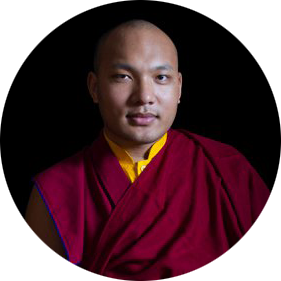 Many see in the growing activity of the 17th Karmapa the dispelling of obstacles in Tibet, India and throughout the world, and the increasingly vivid manifestation of the heart-fulfillment of vision of the Karmapas.